Andy Warhol created several of his now-famous prints of them in 1962 (and another in 1965), one of which sold at a Sotheby's auction in 2013 for $6,875 (it previously belonged to Bernie Madoff). The TV sitcom The Brady Bunch even featured an entire episode about them (Episode 15 from Season 1, entitled the "54-40 and Fight") which aired on January 9, 1970. I'm talking about S&H Green Stamps. In that Brady episode, the Brady's learn that a trading stamp company is going out of business. A fight breaks out over who should get all of the saved stamps, the boys or the girls. If the girls get them, they plan to buy a sewing machine, but if the boys get them, they want to buy a row boat. In the end, they build a house of cards to determine who gets all of the trading stamps, and the girls win the contest, but they end up using the stamps to buy a color television set that the entire family can use (thanks to a little encouragement from Mrs. Brady). 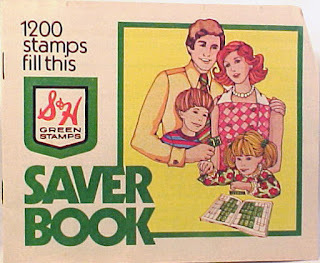 I recall going to the Green Stamps redemption center with my aunt in the 1970s when S&H announced the Green Stamp program was ending, or at the very least that redemption centers nationwide were closing. At the time, the center looked similar to the one depicted in The Brady Bunch. We ended up getting an electric fondue pot. 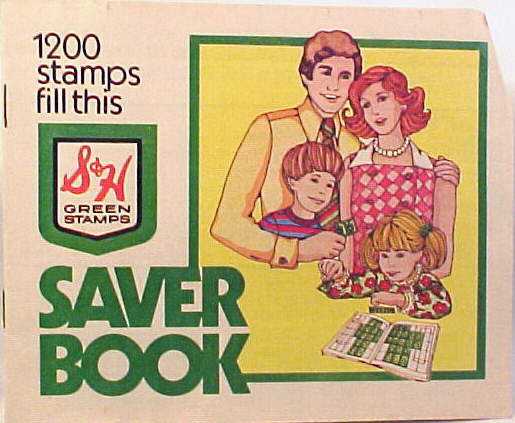 The Brady's called them "trading stamps", although I think most Americans knew them better as Green Stamps. I'm referring to Sperry and Hutchinson's (S&H) Green Stamps (although S&H stamps were pink-colored in the UK). The company then known as Sperry and Hutchison Co. was founded back in 1896 by Thomas Sperry of Cranford, New Jersey and Shelley Byron Hutchinson of Ypsilanti, Michigan. 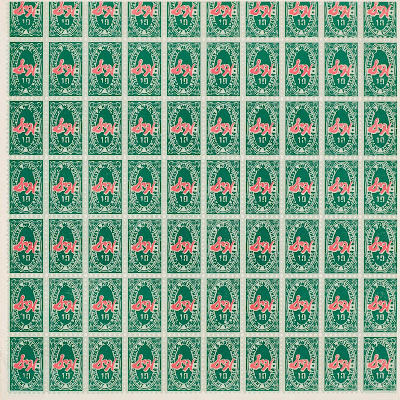 Andy Warhol's 1962 print "S&H Green Stamps"
Indeed, Andy Warhol's art was depicting the famous S&H Green Stamps, not some generic trading stamps. The stamps were somewhat similar to the kind sold in the U.S. Post Office (indeed, S&H once boasted that it issued three times as many stamps as the U.S. Postal Service). They were essentially paper coupons with a gummed backing, cut into perforated squares and usually with a unique, colorful design and some serial numbers printed on them. S&H Green Stamps were colored green except for the big red "S&H" logo in the center and a unique serial number of each stamp, presumably to control fraud. Also, Green Stamps could not be used to mail any letters. Wikipedia reports that series of recessions decreased sales of green stamps and the stamp programs of their competitors. The value of the rewards also declined substantially during the same period, requiring either far more stamps to get a worthwhile item, or spending much more money for an item that was barely discounted from the price at regular retail stores, which created a general downward spiral as fewer and fewer people saw the stamps as worth the effort anymore. Then, in 1972, the company was brought before the U.S. Supreme Court for violating the unfairness doctrine. In Federal Trade Commission v. Sperry & Hutchinson Trading Stamp Co., the court held that restricting the trade of the stamps was illegal (in other words, people were free to give or sell their stamps to others). Sperry and Hutchinson was sold by the founders' successors in 1981. In 1999, it was purchased from a holding firm by a member of the founding Sperry family. 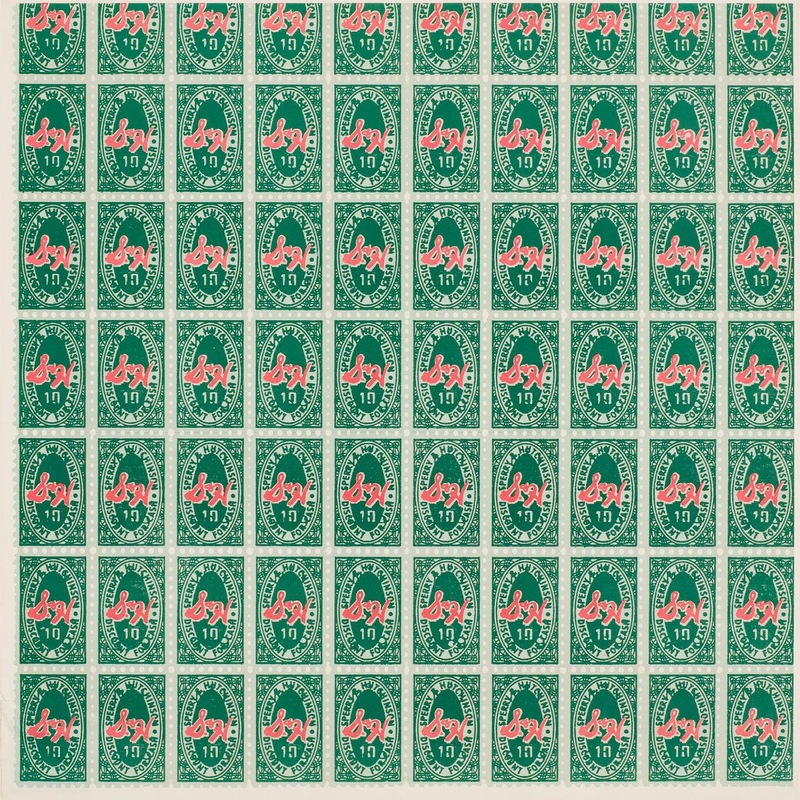 At that time, only about 100 U.S. stores were still even offering Green Stamps. Eventually, with the rise of the internet and the world wide web, the company modified its practices, and it started offering "greenpoints" as rewards for online purchases. But the program was nowhere near its peak in popularity of the early 1970's, and there was plenty of competition, mainly from the retailers themselves who used to rely on S&H to operate the stamp program on their behalf, only they are managing loyalty programs for themselves. "How cool was this: after you paid for groceries or gasoline you didn't just get change, you received stamps that could be redeemed for things you wanted! This is not a tall tale told by parents or grandparents -- like walking two miles to school in waist-deep snow (up hill, both ways) -- it's exactly how S&H Green Stamps worked. " The "currency" were the stamps themselves, usually pasted into coupon books which made it easier for cashiers at redemption centers owned and operated by S&H or the other trading stamp companies to count the number of stamps accumulated (one book, such as the one pictured above, was worth a specified number of stamps, in this case 1,200 stamps) and being redeemed. Consumers could also get catalogs from S&H (or other trading stamp companies) showing the merchandise and how many stamps were required to get each item. In other words, S&H Green Stamps were pretty much just predecessors to more modern electronic loyalty programs like Starbucks Rewards (although electronic, those points can only be used at Starbucks), or a newer program called Plenti Rewards which was being promoted by several companies including American Express, Nationwide insurance, Rite Aid drugstores, Expedia, Hulu, Macy's and ExxonMobil, although that program also ended on July 10, 2018. Outside the U.S., collaborative rewards programs are even more successful, including the popular AirMiles (https://www.airmiles.ca/) program in Canada. 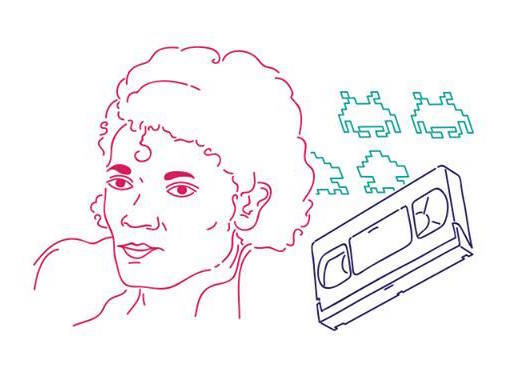 Loyalty programs have been popular forever by retailers of all varieties. For example, your local coffee shop, deli or dry cleaner might have a "punch card" system where they mark each purchase, and once you've accumulated a certain number of purchases, you might receive a free cup of coffee, soup, sandwich or free item to be dry cleaned. It seems loyalty programs never die completely, but managing the outstanding rewards liability is a skill, and not every program is successful at managing that aspect. For example, U.S. airlines have rightly been criticized for devaluing their "frequent flyer" programs with excessive blackout dates, restrictions, limitations, etc. They've also added new fees for checked baggage. Others have migrated from rewarding purchase frequency to rewarding the dollars actually spent with the airline (Delta Airlines was the first to modify its program this way, but most observers believe that all are likely to move in the same direction). Starbucks, too, received some unfavorable press (see https://www.buzzfeed.com/venessawong/starbucks-changed-its-rewards-and-people-are-not-happy for more) for modifications it made to its reward program in 2016. However, for retailers of any kind, they want to encourage loyalty, frequency AND spending. But once a program is already in place, changes usually result in some customers being unhappy. Finding the right balance is key. As for trading stamps like S&H Green Stamps, those seem unlikely to return. But S&H Green Stamps earned their rightful place in American folklore because the program had grown SO big. Whether programs that rival Green Stamps' size emerge in the future remain to be seen.